Join us as Mo Timbo shares his own personal story from Gangs, Guns and Knives. Come and hear a real life story of how a life can change. 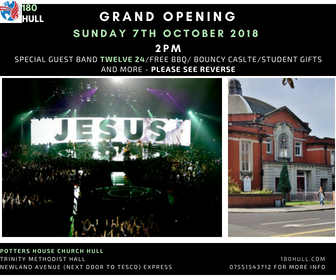 Mo Timbo is the Senior Pastor of Potters House Church Hull. Mo Timbo has worked with No More Knives in Hull, Mo Timbo has featured on BBC look north and has made real impact in the city of Hull. Amazing Sunday international Sunday. Free international food, music, special water baptism service and guest speaker Pastor Yaw. Join us for a 3 week series. We have 3 practical and insightful seminars for you. We will discuss Toxic Masculinity, Toxic Femininty and Toxic Relationships…. Great advice, warning signs and more…Every Sunday 2pm. "LOVE IS FOR EVERYONE AND ANYONE"